Hello Friends, looking for IB Recruitment 2018 - 2019 ? 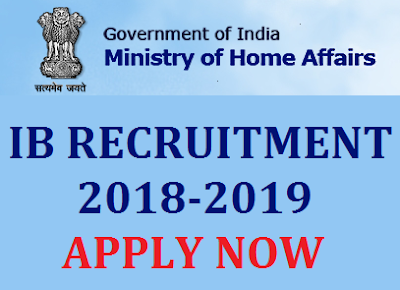 Intelligence Bureau under Ministry of Home Affairs has posted yet another employment notification for the recruitment of Intelligence Officer posts. Online applications are invited for filling up 427 Assistant Central Intelligence Officer (ACIO), Depty Central Intelligence Officer (DCIO), Junior Intelligence Officer (JIO) & Security Assistant vacancies in the various Subsidiary Intelligence Bureau, Ministry of Home Affairs, Government of India. Eligible and interested candidates can apply through online mode on or before 2018. Further details like age limit, educational qualification, how to apply, selection process and online application form are given below. Feel free to ask questions related to IB recruitment 2018 in the comments below. Organization Name: IB, Ministry of Home Affairs. Age Limit: Candidates age should be between 18 years to 30 years as on 02-10-2018. Age relaxation is applicable as per the Government rules. Educational Qualifications: Candidates must possess qualification of Bachelor's Degree and also having knowledge of computer. Refer to official notification for more details. Application Fee: General and other unreserved candidates are required to pay Rs. 50/- while SC/ ST/ Physically Handicapped/ Women/ Ex-Servicemen category candidates are exempted from paying application fee. Pay Scale: Following salary will be provided. DCIO: Rs 15,600-39, 100 + Grade Pay Rs 5400. ACIO: Rs 9,300-34, 800 + Grade Pay Rs 4600. JIO: Rs 5,200-20, 200 + Grade Pay Rs 2400. Security Assistant: Rs 5,200-20, 200 + Grade Pay Rs 2400. Online Application Form: All those candidates who wish to apply for IB DCIO, ACIO, Assistant and Junior Intelligence officer Posts in Intelligence Bureau, they are required to apply through online mode on IB’s official website at www.mha.nic.in on or before 22nd October 2017. After filling online application candidates are required to take print out of the system generated online application form for further use. How to Apply Online: Before start applying online, candidates must have valid Email ID and scanned copy of Photograph & Signature. Find the link of “Assistant & Jr Intelligence Officer” and click on Apply Online. More Details: Candidates are strongly advised to read official recruitment notification for more details about IB Recruitment for Intelligence officer (ACIO, DCIO, JIO) Posts regarding age limit, educational qualifications, last date, pay scale, how to apply and online application form. Candidates can also comment below for more details regarding Pay scale,education qualification etc. Applicants can also follow us for more details and updates regarding the Government jobs 2018 - 2019 or you can also follow us on Facebook for latest jobs updates. Latest updates regarding IB Recruitment 2018 will be published so keep visiting on www.jobsfundaz.com. Soon more details for IB Recruitment 2018 - 2019 for ACIO/ JIO, Officer Posts will be available online so keep visiting our website for further details and updates. Fell free to ask questions in below comments regarding Intelligence Bureau IB Recruitment 2018 - 2019 Officer Posts stay connected with us on Facebook or Google+. To get email updates from us subscribe to our Newsletter below.